Entries from Digital Intelligence tagged with "daily mail"
In a surprising move, publisher People’s Daily of China has struck a content-sharing deal with the UK's Mail Online. Daily Mail owner to buy Yahoo? The owner of the Daily Mail has become the latest media giant to consider buying Yahoo, according to a news report. Mail Online’s digital advertising grew 16% in the last 11 months ending August 2015, marking a significant drop on the same period last year for one of the world's biggest online publications. The birth of the royal baby has led to a huge jump in visits to news and media websites, with tabloids receiving twice as much traffic as broadsheet websites, according to new research from Experian. The Daily Mail has begun an affiliate marketing scheme, offerering advertisers paid links from MailOnline articles. 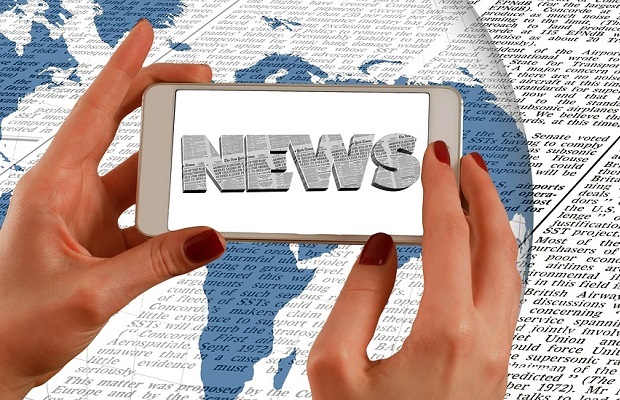 Stories from the BBC website are most likely to be displayed in news results in Google.co.uk search results, ahead of The Guardian and the Daily Mail, according to new research from search and social analytics leader, Searchmetrics. The Daily Mail has launched a premium content channel on its hugely popular website, as the publisher looks to expand its online business model beyond ad revenues. This chart shows the unique visitors for online newspapers for October 2012. During the measured period over 644 million people worldwide visitied an online newspaper. This figure accounts for more than 42% of the worldwide internet population. 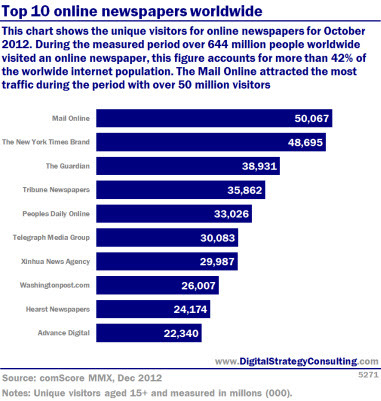 The Mail Online attracted the most traffic during the period with over 50 million visitors. The Daily Mail plans to expand its US operations, as the UK newspaper looks to capitalise on its growing audience across the Atlantic. The Guardian reports that the Daily Mail & General Trust (DMGT) will double its US Mail Online operation as part of a multi-million pound investment in its digital business. Currently Mail Online employs 30 to 40 staff in the US, new staff numbers are likely to be around 80 employees. Mail Newspapers is running a competition for media agencies, as the Daily Mail publisher looks to prove its print publications can drive sales online. The publisher is offering a prize of £250,000 in free print advertising to the winning media agency. To win, media agencies must partner with a client and describe in 250 words or less why their brand would benefit from using Mail Newspapers to drive traffic online. The Daily Mail website has generated 2 million 'pins' on Pinterest, with the Guardian getting the greatest number of shares for a single article, according to new research. 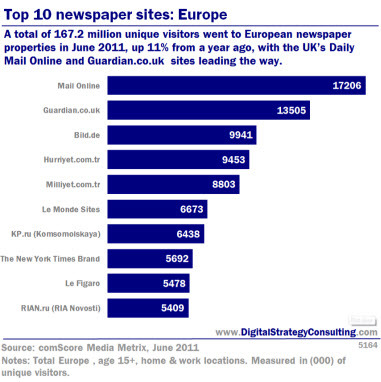 The study, from Searchmetrics, looked at how 13 UK newspaper websites were using the online scrapbooking tool. Mail Online - the world's leading online English-language newspaper website - has turned its first ever profit as revenues rose 80% year-on-year, predominantly driven by online advertising sales. Revenues for the quarter were boosted in the UK by the Queen's Jubilee and Euro 2012 football championship. Many UK parents are ignoring Facebook’s age limit and letting under 13-year-olds access the social network, according to a UK government minister. Children’s minister Tim Loughton believes parents are putting their children at risk by helping them to set up Facebook profiles and were even helping their child ‘lie’ to go on the site. US classifieds giant Manheim has bought Motors.co.uk, from Daily Mail General Trust (DMGT), the firm that publishes the Daily Mail and Mail On Sunday. Motors.co.uk is the UK’s second largest online used vehicle classified with 161,000 used cars registered in its site. The amount paid by Manheim is undisclosed.